Fijian-Samoan chef Robert Oliver’s love for Pacific Island food has seen him develop international restaurants, drive farm-to-table resorts in the Caribbean, and feed the homeless and sick in New York City. 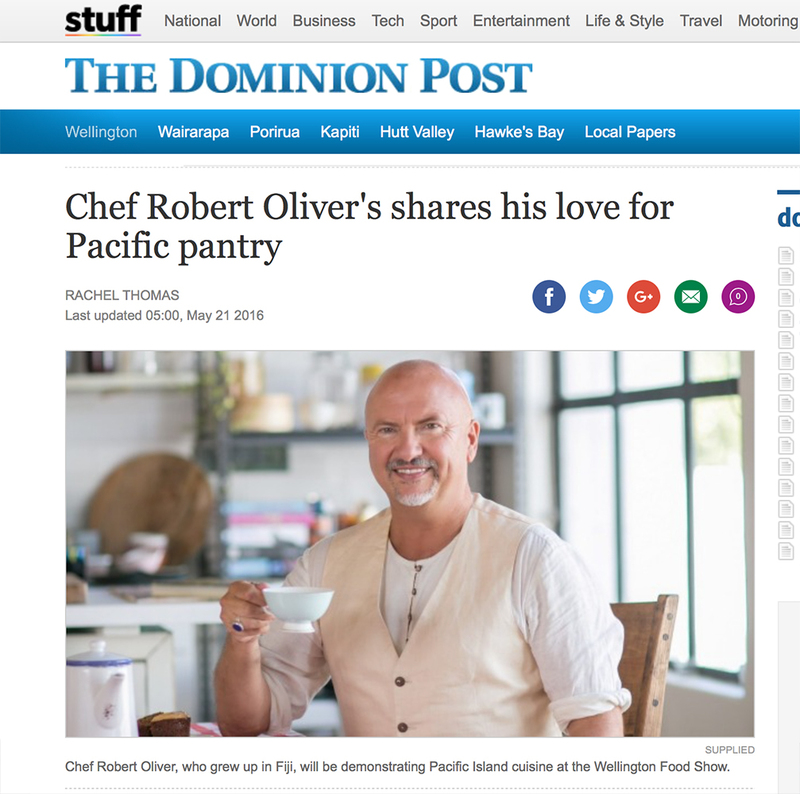 He’ll be cooking at the Wellington Food Show, on this weekend at Westpac Stadium. Catch him and his co-host, Cindy of Samoa, in the Whirlpool Cooking Theatre on Saturday from 12.30pm-1.15pm. I’ve done a smoked pork belly with Samoan cocoa with chilli and honey glaze, and I loved that. My books are about culture not just about plates of food. So if someone asks what’s my signature dish I’m probably going to think people not just dishes. Tell us a bit about your food show segment, which you’re doing with fa’afafine co-host, Cindy of Samoa. I’m doing demos in the cooking theatre, so they’ve got a chef’s programme. Cindy and I are doing two raw fish dishes and then we’re making Koko Samoa, which is hot cocoa from Samoan cocoa. I included Cindy because I often find shows a bit static. I said to the team at the food show ‘let me bring in a real entertainer to keep the energy’. She’s so hilarious and irreverent and fun. You’ve worked in five-star restaurants, on TV, in resorts, but also developed programmes to feed the homeless and aids sufferers in New York. Can you tell us why you decide to do the latter? I think it’s part of the nature of food. Food isn’t just gastronomy or creativity, it’s also hunger and nourishment. I was raised in the Pacific where everyone has plenty of food. Those programmes, which were in New York many years ago, were a heart response for me that everyone should have food. A lot of my current work is in the Pacific and there’s kind of a social mission in that. I work with an amazing women’s group called Women in Business Development and it’s a network of about 1000 organic family farms. I’m working on getting their supplies channelled into the Samoan tourism industry. What’s the trick to getting the perfect poached eggs? It’s not vinegar! I don’t actually know, but I saw something on an aeroplane recently which said don’t use vinegar, use salt, and salt makes everything good. Suppose a dinner guest is vegan, gluten free and sugar free. What would you cook them? There’s lots you can cook them. I think of the whole Pacific tool kit. I would do Taro leaves with coconut cream and some breadfruit and there’s always fruits you can follow it up with. Any Pacific market will make that question into a non-problematic thing. What was the last book you read and was it any good? I’m re-reading Cooked by Michael Pollan. I just watched the series on Netflix [based on the book] called Cooked. For anyone in food it’s essential reading. If you could invite four people, dead or alive, to dinner, who would they be and why? I mean a couple of great artists like Frida Kahlo and Dorothy Parker cos she has a great wit. Frida Kahlo for her flamboyance. David Bowie just because, for my generation he shaped us all. And Leonardo Da Vinci. One of those original thinkers. I would serve them Pacific Island food. We would do the pork I mentioned, we’d do fish cooked in banana leaves with fresh coconut and lemon grass and lime leaves. We’d do green bananas made into a salad with tomatoes, coconut oil and turmeric. Everything would be shared. And raw fish. New Zealand wine, of course. The wine from Waipara Hills [2014 Waipara Hills Equinox Sauvignon Blanc] last time at the food show was delicious.